APCARL falls victim to political manipulations and no work. 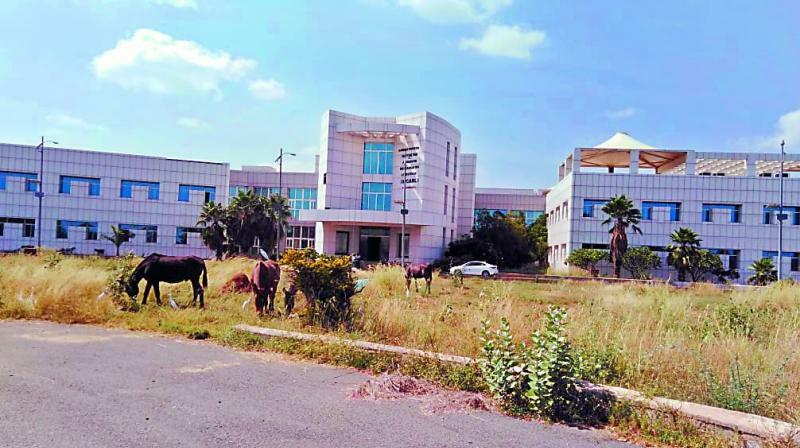 Kadapa: It is 10 years since the Andhra Pradesh Centre for Advanced Research on Livestock (APCARL) was set up in Pulivendala at a cost of Rs 280 crore to support dairy farmers in Kadapa district. But not a single research institute has set up shop, and in fact, the buildings are in disuse. Two or three institutions claimed that they were doing research here. But, there is no lab or any of the other facilities needed to do research. The government must arrange two to three laboratories with all facilities for researchers, sources pointed out. Bio safety level -3 (BSL-3) and Animal Bio safety level-3 (ABSL-3) are the most important labs that have to be provided, but have not been. In addition, the animal rest house is also an important amenity however, it has been left incomplete. Without these amenities, no organisation is interested in starting research work, the source said. Despite people from the district demanding that APCARL be completed for the welfare of dairy farmers, nothing has been done. Sources say that APCARL has been a victim of politics. In fact when it was inaugurated on January 25, 2009 by the then CM Y.S. Rajasekhar Reddy, it was called the Indira Gandhi Centre for Advanced Research on Livestock (IGCARL) and 80 per cent of the work which began in 2007 was complete. Because it was a Special Economic Zone project, it’s initially cost of Rs 380 crore came down to Rs 280 crore. Till 2012, almost 90 per cent works were completed. In 2014, when the TD government took office, a number of ministers visited and promised to start full-fledged research. Opposition leader Y.S. Jagan Mohan Reddy visited APCARL on April 2, 2015 and alleged that the government was neglecting the prestigious institution. Immediately the Animal Husbandry Minister Mr Prattipati Pulla Rao and Council Deputy chairman S.V. Satish Kumar Reddy, MP C.M. Ramesh visited the institute along with government officers. Again, in April, 2018, the present animal husbandry minister Adinarayana Reddy visited the institute with senior officials and promised to start research work within a couple of months. He ordered officials to complete the basic works and start the institute within three or four months. But his promise has not been implemented. The man in charge of APCARL, Enjeti Laxmi Prasad, speaking with this correspondent said that two to three institutes were ready to start research labs shortly. He added that Tropical Bovine Genetics from Haryana was ready to start research on embryo transfer technology in partnership with GV Concepts (GVC). He said that the proposal was in the MoU stage.